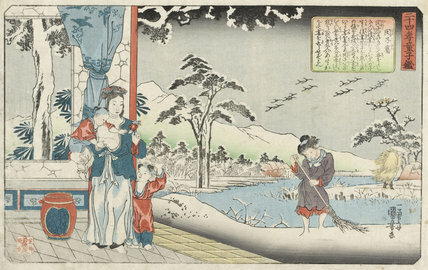 colour print from woodblocks, Oban format, circa 1844-1846. Signed: Ichiyusai Kuniyoshi ga. Publishers: Wakasaya Yoichi and Shiba Shimmeimae. Binshiken. From the series Nijushiko doji kagami (Mirror of the Twenty-Four Paragons of Filial Piety). © The Fitzwilliam Museum, Cambridge, UK.